Welcome to my stop on the Better Off Dead Tour. The tour was arranged by Innovative Online Book Tours. Below you can see the synopsis of the book as well as my review. 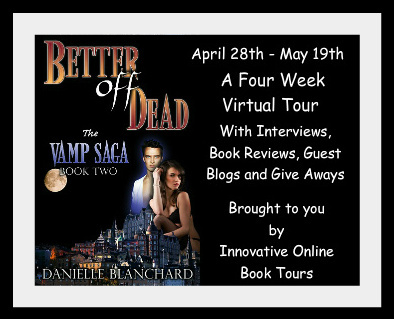 I also had an author interview with Danielle Blanchard that can be viewed on my previous post (or you can click HERE). Welcome to Western Europe in 2020. The International Vampire Council are in the middle of intense negotiations with the Global Six when a mysterious plot is revealed to end Manon's life and thinly veiled lies Mikkel has told his wife will be exposed once and for all. This is a complex soap opera type of book with vampires as the cast. It contains vampire politics, backstabbing, and ulterior motives. Blanchard offers a fresh prospective on vampires that is no where near the norm. If you want to read something unique, I would suggest you pick up this series. The main character is Manon, she is a Day Walker and able to convert people of her blood line into Day Walkers. After converting a few more family members it is realized that there is a threat to her life. Her husband's son, Emmerik, escorts Manon to safety. While alone together a romance sparks between Manon and Emmerik that cannot be denied. I found myself liking Emmerik more than his father Mikkel and hoping Manon would find a way to be with him. There is a ton of vampire politics in this book. This is mainly focused around Manon, Mikkel, Emmerik, and the International Vampire Council (I.V.C.). I found it slightly difficult to keep the characters straight, but liked the book once I remembered everyone. I would suggest reading the first book (Death Wish) in this series before reading book 2 (Better off Dead). Excellent post, very well thought out review. 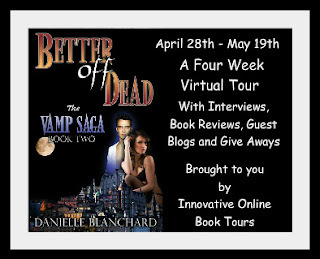 Thank you for hosting Better off dead!